Patients often ask me how to cure gum disease, and about cures for gum disease in general. Reversing gum disease is not easy. There's no magic pill. IN FACT, it is almost impossible to REVERSE the effects of gum disease. BUT IT IS POSSIBLE to arrest the progress of gum disease! You CAN stop gum disease from progressing any further. The effects of gum disease on your general health. Recent research show a link between gum disease and Alzheimer's. There are also links to heart disease, diabetes and osteoporosis. Read more about the Alzheimers connection HERE. Sometimes a dentist or specialist may recommend gum surgery as a gum disease cure. In my experience, there's no point having gum surgery (also called periodontal surgery) if you are not cleaning the plaque off your teeth each day. I have seen so many patients have gum surgery in the hope of reversing gum disease, only to have it all relapse again inside 12 months, BECAUSE your dentist or hygienist did not show you how to clean the plaque off your teeth effectively. Gum surgery is useless if you are still leaving plaque behind, even the smallest scraps. For that reason, I THINK THIS IS THE MOST IMPORTANT PAGE ON THIS ENTIRE WEBSITE! Do you want to save your teeth, and improve your general health too? What you have to do is simple. But it's not easy. It will take fifteen minutes out of your day. Can you find 15 minutes? It will take a bit of practice. And a lot of persistence. But you can do it - IF YOU REALLY WANT TO. You will also be helping to reduce your chances of having a heart attack or a stroke, as well as osteoporosis and diabetes. "ENOUGH sales chit-chat already! Show me the money!" I hear you shout. OK, here's my step-by-step guide to how to cure gum disease. 1. Get a GOOD-QUALITY electric toothbrush. But don't get any electric toothbrush - GET MY TOP-RATED BRUSH, THE CYBERSONIC 3. If you use my special DISCOUNT CODE you can get the Cybersonic3 at around HALF PRICE - that's just $50 ! 2. NEXT, buy some Disclosing Tablets AND some Oral B Pro Expert TAPE. This is MUCH easier to use than normal dental floss. ORDER YOUR ORAL B TAPE DIRECTLY HERE from Amazon. 3. Use any of the major brands of toothpaste. I use Colgate Total myself, but the major brands are all about the same. Avoid any herbal or "alternative" toothpastes. They have little or NO science behind them, and some can be highly abrasive or contain harmful substances. 4. You also need a special mouthwash for gum problems - I recommend a high-quality peroxide-containing mouthwash, which can be very effective, because it releases OXYGEN. The BEST one is the TheraBreath Oral Rinse, available from Amazon. HERE'S WHERE THE RUBBER HITS THE ROAD. 5. Brush your teeth like you normally do. Just do it the same as always. Don't do anything different. Then use a disclosing tablet just like I describe HERE. 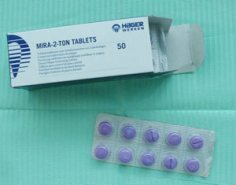 Make sure you follow my recommendations EXACTLY on that page for using the disclosing tablet. THIS STEP IS VERY IMPORTANT! NOW YOU CAN SEE THE BACTERIA YOU ARE LEAVING BEHIND EVERY TIME YOU BRUSH. Make sure you look carefully for that tell-tale color at the gum edges and in between the teeth. 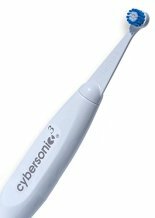 Pick up your new Cybersonic3 toothbrush, and slowly, carefully, let it work away at the gum edges. Most importantly, you also have to go along the inside surfaces of your teeth, along the gum edges next to your palate (the roof of your mouth) of your upper teeth, and along the gum edges next to your tongue of your lower teeth. It's going to take about 10 minutes to brush your teeth PROPERLY. WHY SO LONG? Because you have to let the toothbrush bristles sit on ONE TOOTH AT A TIME for TEN SECONDS. That's 10 seconds on the outside surface next to your cheek or lips; and another 10 seconds on the inner surface next to your palate or tongue. Come on! TEN SECONDS per surface is NOT very long! To get round all your teeth, you need a total of 20 seconds per tooth, multiplied by how many teeth you have. Most people have 28 or fewer. After you have done this, have a REAL CLOSE look at your teeth in the mirror. All the stain from the disclosing tablet should be gone. Congratulations! BUT YOU'RE STILL ONLY HALFWAY TO REVERSING GUM DISEASE! There's another 5 minutes to invest yet! NEXT, get out your Oral B Pro-Expert TAPE, and follow the instructions at Oral B Floss - How to Floss Teeth. This will get to the bacteria that are still IN BETWEEN your teeth, AND UNDER THE GUM EDGES! It's really important to realise that you have to sip the Pro-Expert Tape GENTLY under the gum edge around each tooth. The bad bacteria are UNDER the gum edge. Oral B Pro-Expert tape at Amazon. An extra cleaning method if you're struggling with how to cure gum disease is to use a good quality oral irrigator with a capful of TheraBreath Perio Rinse added to the water in the water tank. If you are careful, you can clean effectively under the gum edges where the plaque can escape from toothbrushing. My new favorite is the THZY Professional Oral Irrigator! The Perio Rinse will release oxygen under the gum, killing the plaque bacteria. You should see your dental hygienist every 8 to 12 weeks so that she can monitor how you're doing. She will be able to show you where you are still missing plaque with your brushing, and help you change your technique slightly to get that plaque off! The dental hygienist will also smooth off and polish any rough edges on fillings and caps that may be acting as plaque traps. This will help you to remove any plaque build-up around your teeth, and help the process of curing gum disease. I hope my guide on how to cure gum disease helps you in some way. As you see, reversing gum disease takes some time and a lot of persistence. And you can't really reverse it as such. But you CAN stop it getting worse!